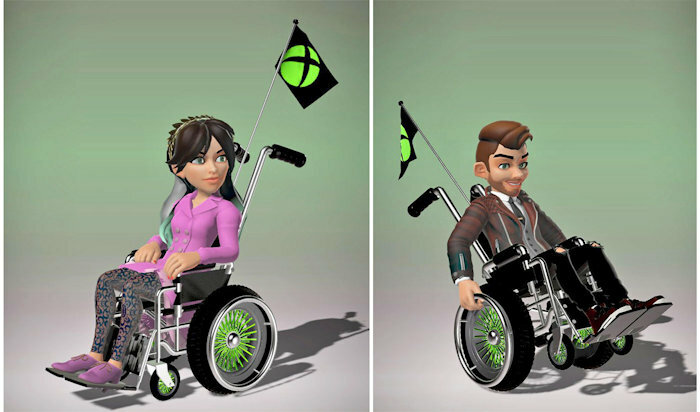 Microsoft’s Phil Spencer has revealed that Microsoft will soon launch wheelchair avatars for Xbox Live. This is great news for disabled gamers who may have been feeling left out with no options for them. Recently after a user tweet suggested that “wheelchairs might be relatively simple” to do, and another suggested a petition, Xbox head Phil Spencer jumped in and said, “No petition needed, we hear you. This is something that we’ve already looked at, [and it’s] not far off.” Soon after, Xbox Director of Program Management Mike Ybarra tweeted a look at two possible avatars, which you can see here. It seems to have taken awhile since sites like Yahoo and Second Life have offered wheelchair avatars since early in their histories. Whatever the reason for taking so long, Microsoft will soon be offering these avatars. Despite being a popular part of Xbox 360, avatars were only recently brought back with the Xbox One Experience UI update. The renders here show more detailed avatars than the existing ones, so it could be a sign that an overall refresh is arriving soon. One that will make your avatars much more detailed and cooler looking. They probably have more plans for avatars as well.